Exploring what makes a place livable, walkable, vibrant and enjoyable for people. You may be asking yourself, “What is placemaking?” That’s a good question and one that I will attempt to answer here on this site. But for now, let me give you a short explanation. According to the Project for Public Spaces, placemaking is defined as “the art of creating public ‘places of the soul,’ that uplift and help us connect to each other.” Another way to define it is “making a public space a living space.” Now, those definitions may be a bit abstract, but I bet you’ve been in a public space where it just felt good. Most people would know this kind of place when they see it – or more likely, when they feel it. Take a look at the picture in this post. This is a picture of City Square in Melbourne, Australia. Melbourne has been called one of the most livable cities in the world. When you look at this picture, what you see? What do you feel? What do you think? When I look at it, I see lots of people congregating in a public space. As I look deeper, I see friendship, camaraderie, brotherhood, happiness, and fellowship. I see a place where people want to spend time because they can, not because they have to. It’s a place where people want to go voluntarily. You know the line from The Field of Dreams that says, “If you build it, they will come”? It’s the same with public spaces. If you make a space for people to stop their busy life and just spend time enjoying each other and the space, they will take advantage of it. This is one of many spaces in Melbourne that is like this. Melbourne was suffering from urban flight in the 1980s like so many other urban areas. The city government made a conscious effort to improve the downtown business district. They hired urban designer Jan Gehl to come in and assess their current situation and make recommendations as to how to improve. That was 1994. Then in 2004, Gehl returned and assessed the situation once more. He found a city that was much more vibrant. There were actually people staying downtown after work, because there were things to do, places to go, people to see. There were street cafes, parks, and public events. 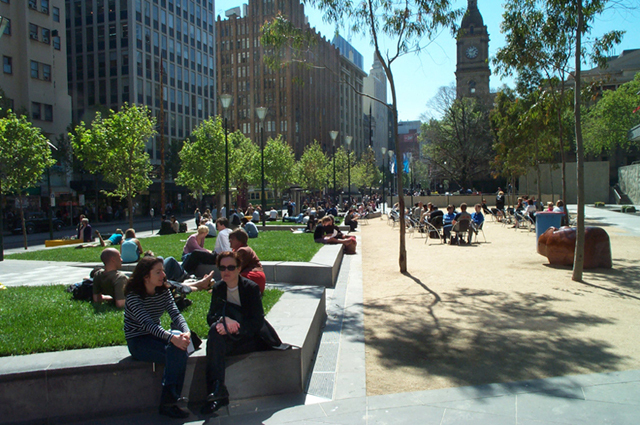 His findings are outlined in his report to the City Council called Places for People, Melbourne 2004. It can be downloaded from his website: Gehl Architects: Urban Quality Consultants. I hope you enjoy following this blog. I know I will enjoy writing here about this interest of mine. It is my hope that this will be a catalyst for change not only in my city of Knoxville, TN, but also in cities across the country. it would be great to see what the place looked like before ! This is a blog that explores what makes a place great, livable, walkable, vibrant and enjoyable for people. It will deal with topics such as urban design, urban planning, city planning, placemaking, land planning, urban transportation, and more. Please sign up for my RSS feed below to keep up to date with the blog. The Greatest Threat to Our Existence: Cul-de-sacs!